Welcome to Williamsburg Learning! We’re so glad you’re here! We want you to have a smooth start, so we’ve created this checklist to help you work through any potential glitches before you start your coursework. Please make sure to complete each task on the list thoroughly to ensure a smooth start to the semester. Need help? Email support@williamsburglearning.com or call 800-200-6869. Book Ordering Begins for Fall 2019 Semester on July 8, 2019. LAU will provide books and necessary science materials for your students. Your list of books and supplies will show in SIS in your "My Students" page. Review our Book Reimbursement Policy in our Student-Parent Handbook, page 24. Fill out the books and materials Reimbursement Request Form. Parents of New Students: If your child hasn't already created their SIS login, have them check their email. An invitation was sent to create their login when you started their application process. Once they have a login and you have registered them for classes and the courses are published (i.e. after August 5th), SIS will create a "Canvas" account for them within the next 15 minutes. Your child's Canvas username and password will be the same as the login they created for SIS. All Students, login to Canvas, bookmark this link, and then customize your Course menu. Here’s a screencast that shows you how. Read “Technology Tools” together. Be sure you have a computer that will work and has the required software programs. Read “Technical Support for Canvas and SIS” together. Students, be sure you can log in and see your courses in both Canvas and SIS. 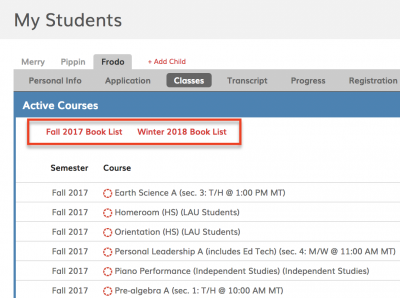 You should be able to see your courses in Canvas about a week before the start of the semester. If your student needs a laptop for this school year, please read the Laptop Handbook, and email your location and laptop request to computers@lautah.org. Non-full time students and SOEP students will be charged $30/semester for computer rentals. Upon registration approval, you may pick up a laptop at our Clearfield Office, 1366 S Legend Hills Dr. Ste 190, M-TH 9-4pm F 9-1pm or by appointment. 800-200-6869 Ext 146. Laptop shipment arrangements will depend on where you live. Upon receipt of the computer, you will confirm the equipment's condition and return the signature card. At that point the student/parent/guardian will assume custody and full responsibility of the computer, including battery, power brick, and cord. Students/parents/guardians are expected to abide by the terms of the Laptop Handbook at all times. If you have any questions about computers, please contact computers@lautah.org. Thursday, August 15: All assignments in New Student Orientation course are due. Monday, August 19: Attend regular classes. Tuesday, August 20: Attend regular classes. New Students: A Live Orientation will be held on Friday, August 16, 2019. Log into SIS using your parent account. Under your student's name, click "Registration." Select your student's courses according to the guidelines on THIS page. You can only register for classes if you've submitted a complete application for that school year and it has been approved. Both new and returning students must complete an application each year, although the returning application is shorter in length. Times listed for classes are in Mountain Time. If you need to change your schedule, try the "Drop/Switch" feature in SIS. There may be some limitations though since all enrollments and changes must be approved by the school. If you have any questions, please contact Kate Chaney at kate@lautah.org. SIS is where you can check your student's schedule, grades, and pacing and also communicate with mentors. It may be helpful to bookmark the site. You'll also find a link to SIS at the top right of this website. RISE & ACT Testing information is available from our office.